Growing up, Christmas was a big deal in our house. My dad believed in going all out with gifts at this time of year. He grew up in a large family during the Depression. He always remembered not getting what he wanted because money was always tight. The story goes that he vowed that his children would not have the same experience as he did. Needless to say, the living room in our small ranch house was overflowing with gifts for my brother, mother and me. As I am writing this, I can still picture all the gifts we received over the years. Barbies, kitchen sets, drum sets, guitars, games, clothes, toy guns and helmets (Vietnam loomed large then), bikes ( I actually rode mine in the kitchen while mom was putting the turkey in the oven!). My dad was a huge believer in Santa Claus and insisted that he existed well into our teenage years. But even though we were spoiled at Christmas, my brother and I never asked for anything outrageous. We were always overjoyed and appreciative of the gifts we received. One year-maybe 1975-my dad asked me if there was something that I wanted for Christmas but probably would not get. I replied that I really wanted a stereo system but knew that they could not afford one. Rock and Roll music and FM radio were in their heyday and it seemed like everyone was listening to their stereos full blast and buying albums that featured the Stones, Led Zeppelin and Aerosmith, among others. On December 23rd of that year, we were at my Nana and Grandpa’s apartment enjoying our annual roast pork dinner. Nana always made a special meal or shared a Christmas tradition with each of her five children. Our time was always on this date. After dinner, my father asked me to go into the bedroom because Santa had delivered a present to the apartment for my brother and me. Apparently, it was hidden under the bed. I pulled out a long, wrapped and somewhat heavy box. On the tag it said: “To Kim and David From Santa. Do not open until December 25th.” My brother and I were puzzled as to what it could be. Like I said, we had no expectations at all for any big gifts. When family and friends gathered at our house on Christmas Eve, I told my uncle about the gift. “Don’t open it first,” he said. “Save it for last.” He knew that my dad would be dying to see our faces right away. We did as he suggested. Together the two of us opened the gift last on Christmas morning. And WOW! We were dumbfounded! An Am/FM stereo system with a turntable and two speakers! Of course, my dad persisted in saying that he and my mother did not purchase it-Santa did. That stereo stayed with me for many years. In high school, I listened to many of rock’s best albums on it. All of Fleetwood Mac, Jackson Browne, Elton John, The Eagles, Billy Joel, Chicago. I brought it with me to college and blasted Bruce and U2 ( the early 80’s albums-OMG!) and The Clash. For me the gift symbolizes many things: Rock music at its best, memories of my teenage and college years, but most of all my father’s unconditional love. Write about your most memorable childhood gift. Was is a Christmas gift? A Birthday gift? Was is something you really wanted or was it a surprise that ended up holding a sentimental place in your heart? What do you remember? How did it make you feel? Tessa had her suspicions but could never put her finger on any exact proof. Her connections in the high rolling corporate world provided her with ample opportunities to work and play with powerful men. Normally, she kept them at arm’s length, both literally and figuratively. Staying objective while covering the news of the latest takeover or insider scandal was the code by which she lived and breathed. Because of this, she earned the trust of her readers as well as the editors at the paper. It was no accident that she was the recipient of many awards for journalistic excellence. Her non-confrontational style broke down barriers and got many of her sources to confess their dirty deeds. Tessa worked hard to keep her private life out of plain sight. Covering investigative stories sapped her mental energy and often brought her instant recognition when out in public. Shopping for herself was challenging and dating nearly impossible as many dinners were often interrupted by the ringing of her phone or her “fans”. One gray Sunday afternoon, she saw an ad on the Internet for the sale of a little cottage in Bucks County. Just what I need she thought. A place that will allow for escape from the dregs of the city and the narcissistic qualities of the people I cover. She call the number and made an appointment for the following Saturday afternoon. It was love at first sight. The little yellow bungalow with white shutters and a fertile flower garden exuded cheer and warmth. It had just one bedroom and bath (with a claw footed tub), a working fireplace and an open living and kitchen area. The remote setting was serene with its small sloping lawn and tiny pond stocked with fish. She also took an instant like to the real estate agent showing her the property. Jared was polite and knowledgeable- having grown up in the area as a boy. He, too, had taken to the fast paced city life for a bit but then found himself burned out after years of chasing nothing (as he put it). Now, he dabbled in house selling and renovations throughout the western part of the state. This way he could keep his hair long and his skin brown as a berry. After the purchase, Tessa took some much needed time off from work to move into the house and do some touch-ups on the inside. She often found herself in the company of Jared during her antiquing and hardware excursions. He was delightful and they usually ended their days with dinner in her kitchen or drinks by the pond. As the weather turned colder, she made use of the fireplace. Tessa arrived late one Friday evening to a stack of firewood on her front porch. She knew immediately that Jared had split it for her. 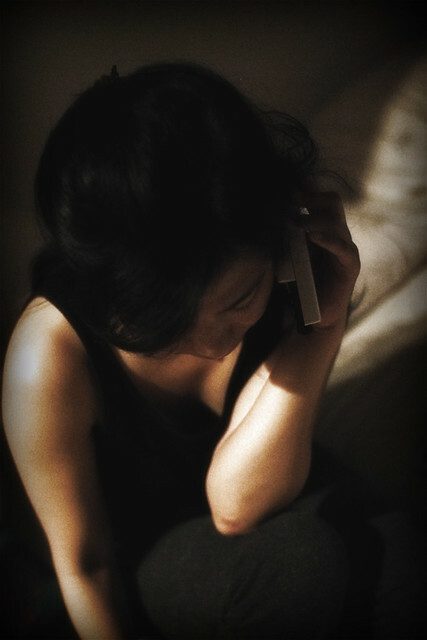 When she called to thank him, she found herself inviting him over. So their year long affair began. Tessa found Jared so easy to talk to-unlike so many of the men she had dated and even interviewed. He was relaxed and generous with his time and encouraged her to open up. She even told him about her latest piece-investigating a drug lord’s ties to a well known investment firm. She felt like she was getting close but was challenged by some of her sources as well as her own desire to go all out in getting answers. For the first time in years, Tessa didn’t have the zealous urge to go after a story. All she wanted by Thursday night was to head down the 101 and fall into Jared’s embrace. Lola attempted to make eye contact with them-to see their faces. But the trio’s eyes were riveted to the floor. They appeared to be a silent cloud of nothingness blending into the colorless surroundings of the chamber. At once, they lifted their arms to reveal three white gowns. They held them out to Lola, Tasha and Grace as if they were gifts. In unison, they moved behind them and began to remove their thin slips from their bodies. Then, just as swiftly, the elaborate dresses were erected onto their frames. At least that is what Lola was thinking. She was no more than a mannequin awaiting display in the window of a department store. And in that instant, Lola locked eyes with her missing mother, Adrienne. A woman of prominent stature, full of vigor and light in the days before, during and after the Revolution, Adrienne was not even a shadow of her former self. Her spirit was erased by the abuse she suffered as a prisoner of the Restoration Party. But upon seeing her daughter, she began to feel a bit of hope. For what, she was not sure. Pulling the secret language from the recesses of her brain, she told her daughter snippets of information in the smallest of gestures. Her companions joined with Tasha and Grace. It was all the six of them could do to control themselves. They had struck gold in terms of moving the plan forward. Lola and her friends discovered Adrienne and her two colleagues were to accompany them to meet the Master. They also discovered that these women had access to all parts of the center because of their status as maids. When they weren’t preparing females for their fate, they could be seen cleaning the Master’s quarters and cooking meals in the vast kitchen. The Master and his councilmen often held elaborate feasts to celebrate any new births that occurred in the Breeding Center or within their own families. These three women were indispensable as chefs for such occasions. It was the only time in their captivity that they could actually speak or give orders. Only females worked in the kitchen and the entire staff was under constant pressure to present a perfect menu. The kitchen was also a training school for women as they were not considered worthy unless they knew how to cook and serve their future husbands. The kitchen-the place where women belonged of course! But also an epicenter of untapped power. If Lola remembered anything that her mother taught her it was this: Never underestimate the inner strength and tenacity of women. Adrienne’s spiritual core may have been corrupted; but Lola’s arrival was the route to its resurrection. Just a little reminder that this story is a continuation in my “Lola” series. She felt like she had been dropped into a time machine. Gender roles were clearly defined. Women and girls were only allowed to do domestic chores while men and boys performed all types of manual labor. In fact, they lived decidedly separate existences except for those who were “married”. Even then, husbands and wives only shared space in the bedroom. Education for girls consisted of preparing them for cooking and cleaning of their future domiciles. They were allowed to grow vegetable and flower gardens and to occasionally roam the fields and woods (escorted) in search of wildflowers or truffles to be used for meals. Religious study was allowed if only to help them better understand that their submissive role was “divinely” ordained. Lola was appalled at the conditions for females. Often, she would be witness to a young woman’s final preparation for “spiritual marriage.” All females had to be pure in order to marry. Those that were deemed not pure enough were often relegated to working in the Saddle Club as entertainers for the “47”-a term for the men who did the Restoration Party’s dirty work. These men were not allowed to marry or breed. They were “rewarded” for catching Restoration Party outlaws with meals and women and were free to do with them what they pleased. There seemed to be no exact standard for purity and many women were often shocked when they received news of their status. Many attempted to kill themselves in order to avoid their fate and others tried to run away only to be shot by the very men for whom they were to be sexual slaves. Still others were deemed to be good breeders (Lola discovered that these women were already mothers but too “old” to marry). They were sent to housing where their cycles were closely monitored. When they were fertile, they were “visited” by high-ranking members of the Restoration Party. The Breeding House was used as a means to further populate the Restoration Party’s members with the goal of regaining power. Lola already knew that her role was going to be different. Over these last few weeks, she had learned that the Master had chosen someone to marry his eldest son by his first wife. In fact, he had chosen three. The one he picked as the most “qualified” was to marry the eldest while the other two were slated to marry son #2 and son #3. So here she was. Sharing space in The Prenuptial cottage with two of her peers. They were as petrified as she was confident. Better still, she knew these girls. And they seemed to know her. Their families were key members of the Renewal Party and she had heard about their disappearance shortly before she was sent on her scouting mission. Wherever Lola had ended up that day in the field, she had now concluded that this was not a holding center but the heart and soul of the Restoration Party’s operations. She just needed to find a way to communicate with Tasha and Grace. Because all of their movements were recorded, speaking openly was out of the question. During the upheaval, Jack had taught Lola and many other Renewal Party members a secret sign language. It proved to be useful now.